This is the street our hotel is off of. I took this just before sundown, when the streetlamps were lit and the setting sun was bathing the Gothic buildings. 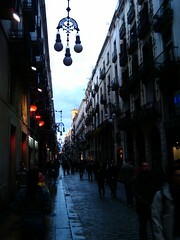 When I took this, I was standing at the entrance to Carrer de Ferran just off Las Ramblas. We found a little place here on Ferran with free Wi-Fi called Fresh & Ready, where I’m eating a strawberry Danone yogurt from a little glass jar. Andy & I just had our first dinner in town– a beautiful hot plate of grilled veggies soaked in olive oil and another plate of tortilla espanola (potato, egg, and cheese cake). Today we lucked out since museums are free the first Sunday of every month. We saw the Picasso, geological, and zoological museums. Tonight, we’re thinking of going to a Spanish guitar concert in a Gothic cathedral. It rained quite a bit today, so the museums were a good option.